Is Clear, Radiant Skin Simply A Plate of Food Away? You know the saying, “beauty starts within”? Well, that’s applicable when it comes to the relationship between food and our skin, too—beauty really is an inside job. The foods we eat have a direct impact on the quality and look of our skin. Acne, irritation, redness, and premature aging can all be the body’s way of saying something is out of balance. It can be hereditary, medication-related, or hormonal, but diet is often to blame. The good news is that these glow-enhancing foods are pretty foolproof and many of them are known wellness staples. “For clear, bright skin, eat foods that contain antioxidants Vitamin A, Vitamin C, essential fatty acids, and zinc,” says Mary Grace Gottsacker, the certified nutritionist at celeb-favorite Joanna Czech. Gottsacker assures us these skin-happy foods can easily be incorporated into your everyday diet. But, when in doubt, she says the easy rule of thumb for glowing skin is to drink tons of water and eat lots of greens and brightly colored vegetables and fruits and consume healthy fats. Forget Skittles— eat Mother Nature’s rainbow instead. 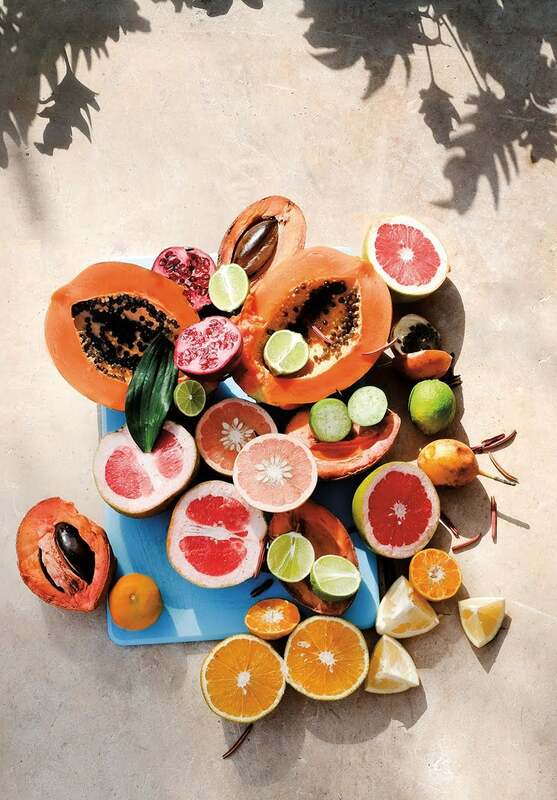 A diet filled with nature’s most vibrant colors can be seriously beneficial to skin’s natural vitality and glow. Look to vibrant citruses, leafy greens, ripe berries, and foods rich in omega-3. Here’s a helpful guide of foods your skin will joyfully eat up. Leafy greens can be huge sources of vital minerals and vitamins, especially Vitamin A, which evens out oil production in the body. Any are great, but spinach, romaine, watercress, arugula, and collard greens are exceptional. Also, don’t forget the herbs: Fresh basil has antibacterial properties, says Wendy Rowe, author of Eat Beautiful: Food and Recipes to Nourish Your Skin From the Inside Out. Other good greens are asparagus, broccolini (high in complexion-clearing Vitamin B2), and green peppers (and red ones too). For fruits, try kiwi and green apples too. Kiwi has high amounts of Vitamin C, while apples help reduce inflammation and breakouts. Sweet potatoes and carrots have incredible amounts of Vitamin A, while citrus, like oranges and lemons, can stabilize collagen. Try eating and drinking the bright orange superfood turmeric, too, which has incredible anti-inflammatory properties. Another tasty option that’s high in Vitamin C is papaya. Berries are a beautiful source of antioxidants, which fight free radicals (aka premature aging and blemishes) within the body and skin. Raspberries, blueberries, and blackberries all are little nutritious powerhouses. Not in the berry family but still usually in a shade of purple—figs, which are actually flowers. They are highly anti-inflammatory and are great for detoxifying, says Rowe. Walnuts, almonds, hazelnuts, pistachios, and Brazil nuts (which are high in zinc too) are all rich in omega-3s, which can promote healthy skin and a happy heart. Speaking of those essential fatty acids and heart-healthy nuts, other good fats include avocados, wild salmon, and walnuts. Rich in fatty acids and omega-3s, salmon and avocado can both have direct, positive, and glowing effects on the skin. A happy, good bacteria–filled gut is maybe the most important key to glowing skin. Eating well, consuming lots of water, and reducing stress are great, but probiotics are essential for boosting the gut. A good probiotic can help your gut work better, allowing it to absorb all these magical nutrients from healthy foods better. Rowe recommends Wild Nutrition, and we’ve had great success with The Nue Co., and Seed. A few gut-promoting foods include onions and leeks, both of which contain a type of dietary fiber that acts as a probiotic within the body. We are basically a walking form of collagen—our skin is composed of 80 percent of it. So organic, grass-fed collagen and bone broth are your skin’s happy foods. Eating them can increase skin’s elasticity and reduce joint pain, plus they’re chock-full of essential amino acids and minerals. Thankfully, the collagen news has gotten out, so you can find bone broth at your local grocery store, and in New York, there is Brodo, mini shops that only serve bone broth. But you can make a big batch yourself at home and sip on it during the day all week long for a powerful boost of collagen. This hurts to write, but all the tasty, sugary stuff is not great for your skin. Sugar, gluten, caffeine, dairy, wheat, and definitely anything processed can lead to blemishes, hormonal imbalances, and an over-production of oil. Try to cut back when possible, especially before big events, and you’ll definitely notice a skin-clearing change. With this list of glow-enhancing, gut-happy superfoods, you’ll have everyone wondering what your skincare secrets are.